Casting aside the Euros for just a few minutes; the latest Whisper to Watch focuses on the possibility of Kevin Strootman moving to Everton. He’s currently contracted with Roma, and the Dutch international has the potential to be a great signing for Ronald Koeman’s side if a deal can be reached between the two sides. Following the fallout from former manager Roberto Martinez being sacked, Everton need to improve on a disappointing mid table finish last term as they were only 10 points ahead of relegated Newcastle. They‘re usually in contention for a European football spot, so it’s clear that Koeman has been brought in with a view to rectifying the fortunes of the squad in the short-term. The midfielder would be a great signing if they’re willing to spend big, although the index rating has slipped from the high 4.5 rating over the past few days. Strootman would definitely be signing to play, and he’s a reasonably complete player. He can pick a pass and he’s known for his physicality, which are attributes that will always come in handy in the Premier League. His nickname is ‘Er Lavatrice’ (the washing machine) because of his ability to clean up play, which should give you a better idea of his particular set of skills. He’s comfortable as a defensive midfielder, but he can also be used as a box-to-box runner thanks to his height, speed and strength. His tackling and screening are the key attributes, and comparisons have been made with Marco Van Bommel. It’s not all rosy, and there’s a reason why he might be willing to make the move to Everton in the first place. Injuries have curtailed his career following cruciate knee damage in 2014, and they’ve continued to dog him during his time at Roma. It doesn’t make for great reading, but the medical team must be aware of his injury worries. Considering the £30m fee that’s doing the rounds, they’ll need to be sure before spending a hefty amount of their transfer budget. They’ve also been linked with Axel Witsel of Zenit, (another central midfielder) which indicates that they want to strengthen in a key area of the pitch. He’s an international colleague of both Romelu Lukaku and Kevin Mirallas, so there’s a decent chance he could slot into the squad with little to no fuss. If they can’t sort out a move for Strootman, it makes sense to move for an established international that is likely to fit into their squad. Either way, it’s clear they want replenish their stocks, and they’re in the market for some of the more exciting midfielders in Europe. Arguably, Everton struggled with the defensive side of things last season because of Roberto Martinez’s refusal to stop playing the game in his style, but Koeman wouldn’t have made the move unless he was assured that the club were able to match his ambitions on the field. The new manager should help to rectify that side of their game, which is why it’s so important to have a creative midfielder who has the ability to mop up in front of the back four. After a difficult season, there’s genuine reason to be optimistic in terms of the future. No matter who they end up signing, they’re going to be harder to beat this term, which should equate to a better position in the final table next year. Liverpool have also been linked with the Roma midfielder in recent weeks, so it’s fair to say that Everton aren’t the only ones interested in taking a punt on risky business. He’d be more likely to be a guaranteed starter at the Toffee’s considering Liverpool’s packed midfield, but it all depends on the terms they offer the Dutch international. Make sure to keep checking the transfer index to stay up to date with the latest deals. 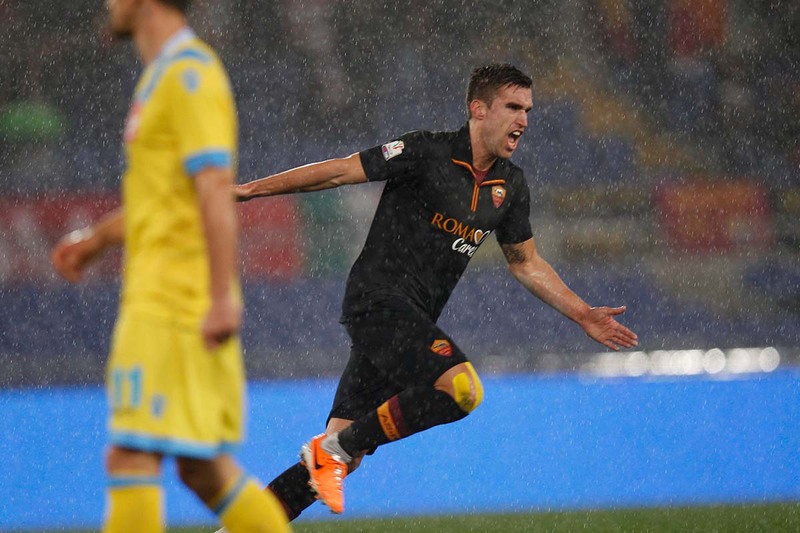 Would the signing of Strootman be a good idea for the Toffees? Considering his injury record it will always be a gamble, but he has the potential to shine if he hits the ground running. Let us know what you think in the comments below!